If you would like to get in some rounds of bowling, while meeting some of Charlotte's well-known media personalities and supporting a good cause, you can do all of this on Friday, May 13. 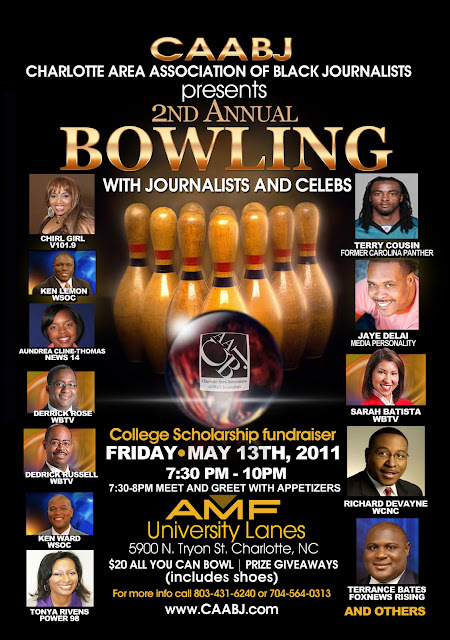 The Charlotte Area Association of Black Journalists are holding their second annual Bowling with the Journalists event from 7:30 to 10 p.m. at AMF University Lanes (5900 N. Tryon St.). Enjoy a meet-and-greet with appetizers, and then bowl all you want for two hours in the lanes CAABJ has reserved. The cost is $20 and that includes shoes. Proceeds will benefit CAABJ's annual college scholarship, which is awarded to a local student majoring in journalism or communications. Tickets can be purchased at www.caabj.com. The flyer below shows some of the media personalities scheduled to attend.